They creep into every corner of your home and before you even notice it, you feel an itch up your nose and there goes a series of loud sneezes that wakes your partner up early in the morning!! It irritates you for while and before you get to the bottom of it, it's gone, all for the better of course, but you still need to find out the cause. So typical of an allergy that many of us face at different times in the day. Sometimes it could get so frustrating and just not stop, while at times it ends with a few sneezes! It could be a task for us to identify the allergen, but here are a few tips to prevent them from making their grand entry. Steam vacuum your furniture and carpets: They carry a lot of microscopic dust mites that can be the cause of your allergy! 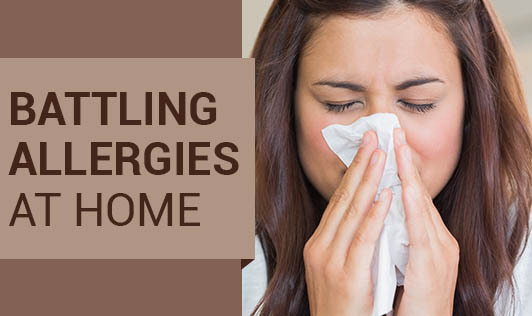 You have people from outside walking on the carpet or sitting on your furniture and they could be bringing allergens from outside. Unclog your gutters: Clogged gutters can result in water seeping into the house, leading to mold growth, which can aggravate allergies. So the next time it rains, check your gutters to make sure there is no water seeping in. Make sure the exhaust vents are not blocked. Run the exhaust fan and/or leave the window and door open when taking a shower or bath. This way the water on the floor dries up soon and you reduce chances of mold growth. Some dust mites may be taking a nap on your bed linen! Wash all your bedding in very hot water every week. It's the best way to kill those mites. The tray under your refrigerator that collects water may be collecting molds. Clean the tray with a bleach solution and sprinkle with salt to reduce mold growth. De-cluttering: Spend some time to remove old clothing. Put away old equipment, shoes and other things that are not being used in a place outside home. Vacuum the floor and walls of your closet and shelves to get rid of dust mites! If you have a pet at home, try to keep them away from the bedroom as they could be spreading dander that could be the cause of your allergy. Use a doormat that is made of synthetic material as they produce lesser lint and do not invite mites, molds and fungus. Whether the mats are made of natural or synthetic fiber, your mats need to be cleaned on a weekly basis. If your porch lights contain dead insects, clean them right away as they can be a potential source of allergens. Leave your footwear outside the house to avoid carrying allergens inside. You could keep a shelf outside or provide soft indoor slippers for your guests. Take a look at your air conditioner: Air conditioners if not cleaned regularly, can harbor molds that could cause an allergic reaction when they start circulating in the air. Make sure you change the filter of the air conditioner regularly. Floorings: Use hard flooring instead of carpets, as carpets collect more dust mites and lint that could be possible allergens. Stuffed toys: If you have a child at home, and you are prone to allergies, try to avoid using stuffed toys for your children as they could be causing the allergy. The next time you have an attack, maybe it's time to clean your linen!